Thread: Alchemical Symbolism in Florence? I'm planning a trip to Florence next year. Maybe it happens to be that someone here knows some cool sights relating to alchemical symbolism there. I found out that there seems to be a fresco on the church Santa Maria Novella, where in the flames of hell "alchimisti et falsificatori" are seen. I'm also open for suggestions near Florence or other alchemical related spots of interest. I guess the cathetral in Sienna may be an interesting option too. Thanks JDP! Of course I know the painting. Didn't know that it is there. I'll visit Palazzo Vecchio. I've been there some months ago... There isn't really an alchemical Icon, but you'll be surprised. Just go to the museums (Ufizzi, Accademia, Palazzo Vecchio, etc) and the paintings and sculptures will show you their symbolism... so you'll be amazed every 2 minutes. Other than that, have in mind that SOME of the museums can only receive a limited amount of visitors and the tickets get "sold out" sometimes for a few days... so buy tickets in ADVANCE on the internet (doing it a week before will do the trick, no need to do it months before... this is specially true for the Accademia). 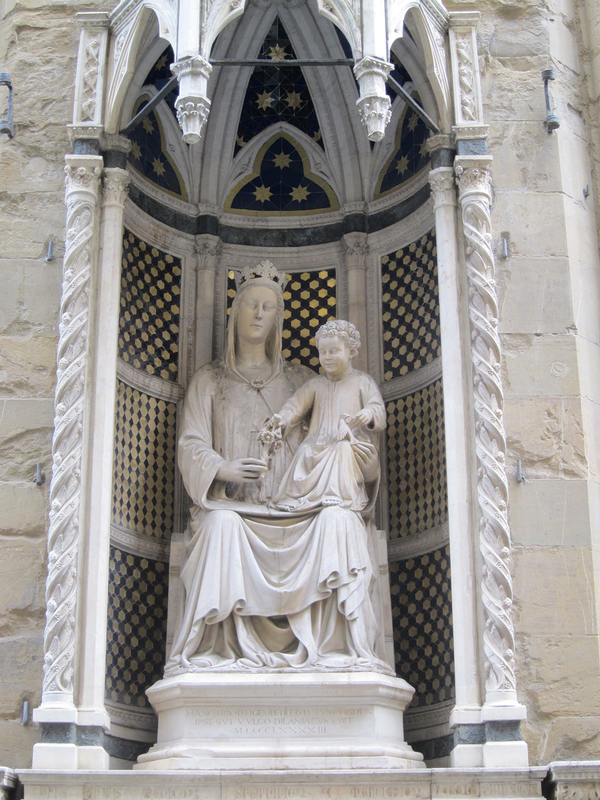 The most important arti are displayed on the walls of the middle age church Orsanmichele. The protection sacred of the "medics and pharmacists" is madonna della rosa. What do you think about creating a map with Google Maps, where everyone marks alchemy related places, arts, buildings and the likes? Fulcanelli does the most incredible elucidation of Alchemical symbolism ever. His level of comprehension of the esoteric is astounding. High on my bucket list is travelling around the world visiting the various libraries that house Alchemy manuscripts. While I have many in digital format, pictures just don't do these manuscripts justice, and seeing a manuscript like the "Splendor Solis" for the first time in person would rock my world. Very little amazes me or gets me excited, but this is something that would honestly captivate me and take my breath away. Has anyone here had the chance to view any illuminated manuscripts or Alchemy texts in person that we are all so familiar with? Cosimo's tomb, i dont know if you can get in there. Edit - Closed to the public. The Medici Collections at Museo Galileo, Florence. Any concrete alchemy related pieces at these places? Would be sad to actually get there and miss the most interesting stuff. The best chance to see the most famous ones would be an exhibition like the Berlin one we were talking about sometimes last year. Almost all european unviserity city has a library with alchemy related books. I don't know if it is easy to be allowed to actually hold the most valuable ones like the original splendor solis (in Berlin too).